As Judith Daws, breeder of many bulldog champions and author of a Pet Owner's Guide to Bulldogs, says: "All dogs age differently - some have really slowed down by the age of eight, while others are still active at ten. I find that the older they get, the more their characters show." A particularity of the bulldog is that they mature slowlier and age faster than most other dog breeds so that childhood and seniorhood are separated by only a few years. Bulldogs are psychologically mature around 36 months but may start showing aging signs as soon as 7 or 8 years, depending on their living conditions, nutrition, health condition (presence of diseases) and their genetic make-up. In any case remember that a bulldog will never complain and that you must anticipate his needs and feel for him. After several years living together you will probably sense when he is failing (like most bulldogs feel our moods and shortcomings). 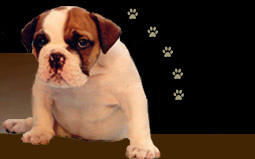 The most common problems of the aging bulldog are deteriorated eyesight and hearing and joints that stiffen up. Elderly dogs are susceptible to an unusual form of intense vertigo, the cause of which is unknown; the affected dog is unable to stand up and remains sprawled on the floor, the eyes displaying intense nystagmus, for typically a few days. While terrifying in appearance, owners often fearing that the dog has had a fatal stroke (which is actually uncommon in dogs), the vertigo passes within a few days and by the end of a week the dog is staggering around upright, and within another week there is no evidence that anything at all had happened. The only risk of the disease is that the dog is unable to eat or drink in that condition, and must receive supportive therapy of intravenous fluids and nutrition; a light sedative is usually also administered, as the dog naturally seems terrified during the experience. However difficult it may seem, do not keep your bulldog alive for your sake if he is in great suffering and there is no hope of recovery. The Bulldog's great courage can keep him going for a while put there is not point in making him endure these weeks of pain. Be fair to him and allow him a dignified end in repayment for all the pleasure he has given you. As the vet to examine your dog in his familiar surroundings he knows and loves and where, if necessary, your bulldog can be put to rest while you comfort him. This is your final kindness to your best friend.